Imagine how difficult it is to fold a 20km long rope into a tennis ball. And, even if you succeed, imagine you are asked to locate a specific section of the rope in the ball which may be 5km from one end. Phew! The biological cells are like the tennis-ball, and the rope here is the DNA in our cells. 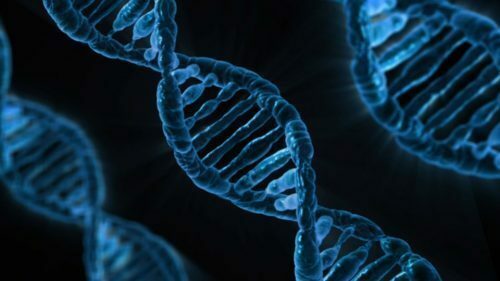 DNA — the genetic material in our cells — is a two-metre long polymer folded and packed inside a micro-meter sized compartment known as cell nucleus. This kind of folding of DNA occurs in each cell of every living organism. Figure 1: Model developed in this work converts 2D contact probability into meaningful 3D model. In our cells, the folding is achieved by a number of machines known as proteins, and the folded DNA-protein complex together is known as chromatin. How proteins achieve this high packing within a limited time is an unresolved puzzle in this field. Any organism, like human beings, have different types of cells — skin cells, brain cells, bone cells, to name just a few. Even though these cells have exactly the same DNA content, they function very differently. This diversity in cell function is achieved by packaging the same in DNA in different manner — the chromatin organization inside the cell dictate the function of the cell. One way to quantify the 3D organization of chromatin is to examine how different parts of the DNA polymer are in contact with each other. Advances in experimental techniques have helped us to measure the contact frequency between any two parts (segments) of the long DNA polymer, after freezing the whole chromatin in time. This experimental technique — chromosome confirmation capture method — gives the frequency with which any two segments will be in contact in a population of cells. This information is 2-dimensional, which is static in time. We need a model which can predict the 3-dimensional configuration and dynamics of DNA based on the contact frequency information investigated through experiments. Kiran Kumari, a research scholar with the IITB-Monash Research Academy, intends to put together such a model in the course of her PhD project titled, ‘Computing the dynamics of Chromatin folding’. Using concepts from polymer physics, she proposes a method to obtain the 3D configuration from a given 2D contact probability heat map. This method can not only predict the steady-state 3D configuration but can also study the dynamics around the steady state. Using this method, she studies 3D configurations and dynamics of chromatin in a length scale of a gene. In particular, her model can predict the interaction profile which is required to produce the contact probability. The Academy is a collaboration between India and Australia that endeavours to strengthen scientific relationships between the two countries. Graduate research scholars study for a dually-badged PhD from both IIT and Monash University, spending time at both institutions to enrich their research experience. Prof Murali Sastry, CEO of the IITB-Monash Research Academy, is watching Kiran’s progress keenly. “This project will enhance our ability to understand mechanisms in biological systems such as biological cells. It will also help us understand the fundamental molecular aspects of biodiversity — all of which are essential to harness biomolecular processes, whether in health care or biotechnology,” he says. The above story is based on inputs from the research student, her supervisors, and IITB-Monash Research Academy. Copyright IITB-Monash Research Academy.